The Tufted Titmouse is a common visitor to backyard feeders and known in the birding world for its specific look. The soft silver color on the top and some whiter below, with a small patch of peach-gold colored wash just under the wings. This bird is known for its acrobatic feeding habits, similar to the famous chickadees. Titimouse are sociable birds and can be seen in groups when in breeding season, but in pairs in winter. Chickadee and nuthatches are its common feeding friends, and can be seen congregating with them together at feeders. Tufted Titimouse are mostly found in deciduous end evergreen woodland areas, parks and next to backyard feeders, These birds can be easily attracted by birders when the right food is offered. Tufted Titmouce do not migrate in winter, and can be seen in their range in all seasons. Titmice will often let other more aggressive birds ear first, than fly and take some seed when feeding at feeders. Just like the chickadees, these birds like to stash food for later. One tufted Titmice can have several hideouts where they hide the food, specially in winter. The food is usually buried in the ground or stuck in tree holes. They can have hundreds of seeds or berries hidden around their territory, in the effort to always have food when sources are not abundant. Just like most of the wild birds it loves sunflower seed, and it is the best option if you want to attract them to your backyard. By providing sunflower seed you will also attract many other bird species like chickadees, finches and sparrows. Placing seed, suet and mealworms feeders is the easiest way attract them to your yard. In spring and summer insects are the most common titmice food source, bees, bugs and spiders are usually on the menu. When cold winter comes tufted titmice will switch to wild berries and seed since insects are not available. That is why you will mostly see this bird at your seed feeders in autumn and winter, and will love to snack on mealworms that you offer in summer. Tufted Titmice can be mostly seen flying around in pairs, these birds are monogamous and mate for life. They can raise more than one brood in nesting season, and sometime one of their young stayes with them true the winter and even helps them raise the next broad in spring. Why they do that in unclear, but it helps the group to have greater chances of survival. These birds are cavity nesters and will find little holes in trees, rocks and man-made nest boxes to lay eggs. They often use woodpecker holes or dead trees to find homes, and when these are not around tufted titmice will readily inhabit backyard birdhouses. Lot of these birds have grown accustomed to humans and will often hangout in parks, yards and suburban areas. They like to build their nests high above the ground, at and if you plant to install a bird house it is recommended to place it a s high as possible and placed under heavy tree canopy. 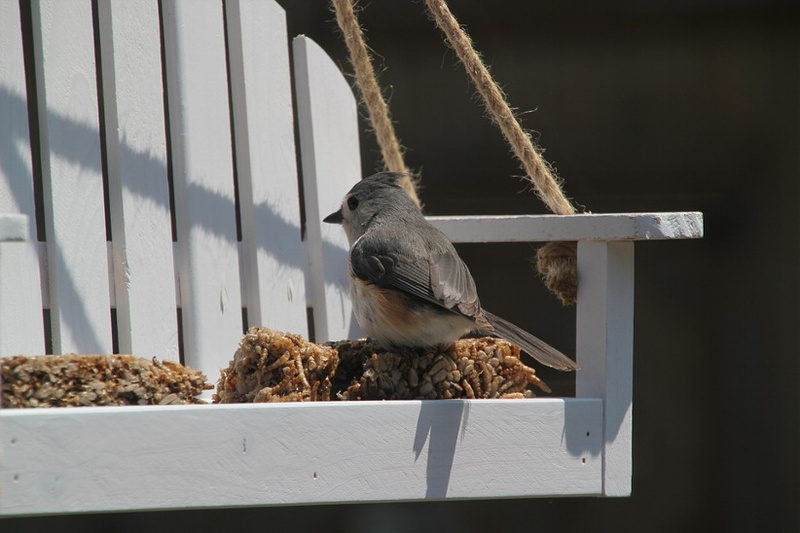 Tufted Titmice dont like open areas, so placing the bird house in the open will not attract them. You can use birdhouses made for chickadees since these birds have similar needs. Bird baths are one more great way to provide a reason for these birds to visit your backyard. By installing a bird bath you will not only invite Tufted Titmice but lots of other species like finches, sparrow and doves to be your daily visitors. Make sure your clean your feeders and baths once in a while and you will have a healthy and happy bird population to admire next to your home. Tufted Titmice are not scared of people and can recognize human voices and even faces, and their curious nature will bring them over to your bird feeder when that see the familiar face coming. Have a great time birding and keep feeding those little birds!